Evaporation from water or soil surfaces and transpiration from plants combine to return available water at the surface layer back to the bulk atmosphere in a process called evapotranspiration. Much of our understanding of the complex feedback mechanisms between the Earth’s surface and the surrounding atmosphere is focused on quantifying this process. At its most fundamental level, evapotranspiration is the loss of water from a surface to the atmosphere, achieved through vaporization. The complex nature of the evaporative process, however, includes mechanisms such as turbulent transport, feedback between the surface and atmosphere, and the biophysical nature of transpiration – all of which combine to make both measurement and estimation a difficult task. 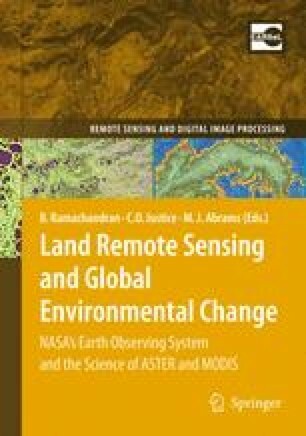 NASA supported this work through grant NNG04GQ32G: A Terrestrial Evaporation Product Using MODIS Data. This support is gratefully acknowledged.